It was in 1840 that a pioneer circuit-riding preacher arrived in Sheboygan on horseback. The name of this minister was Rev. John Lutz who rode all the way from Illinois, stopping first at Milwaukee which was then a town of 1,810 inhabitants, and then riding on to Sheboygan. Rev. Lutz, an Evangelical minister, preached the first German Protestant sermon in Sheboygan, and made his headquarters with Mr. Mohr. In 1846 the Rev. J. G. Miller came through Sheboygan and conducted services among the homes of the people. He foresaw German settles who were coming into this state. Sheboygan at this time was but a village of 700 people. It was in this year that the great German immigration movement started to the United States. It was also in this year of 1848 that Wisconsin was admitted into the Union as a state. By 1849 the small congregation had 35 members. Some of the first families of the church were the families of Mohr, Schmerler, Meier and Schwalbe. In June, 1851, the Rev. George Fleischer was stationed at Sheboygan. It was in 1853 that the congregation built a church, which was dedicated on April 3rd of that year under the Rev. Henry Esch’s leadership. The church was located on Niagara Avenue. The membership grew in the next 30 years and there was rapid change of pastors as was the custom in this denomination of that day. In 1871 the congregation sold their old church and moved near the present location, building a second church. In 1889 a brick church was built at a cost of $6,000, under the ministry of the Rev. Wellso. In 1900 the Wisconsin Conference of the Evangelical church was held in Sheboygan. Throughout the years great spiritual meetings were held where many found Christ as their Lord and Master. 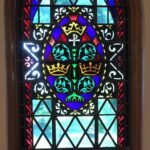 In 1925 the church was remodeled and the beautiful stain-glass windows were installed. In 1944 the interior was redecorated and new alter furniture of light oak was placed in the chancel. The parsonage adjacent to the church on Ninth Street was erected in 1923. Rev. Kenneth Krueger came to serve as pastor of this congregation in 1943. It was under his direction that the present church was constructed. In 1946 at Johnstown, PA, the Evangelical Church and the United Brethren Church combined to form the Evangelical United Brethren Church, a church over 700,000 members in the United States. Ground breaking ceremony for the new church took place October 22, 1950, and the Cornerstone Laying was in July 18, 1951. During 1952 the last service was held in the old church on April 27th and the Dedication of the new church was celebrated August 10th. Only 6 years passed before the Mortgage Burning Ceremony was observed on November 16, 1958. The beautiful Moller Pipe Organ in the sanctuary was a gift to the church from Mrs. E. H. Miller and was dedicated August 22, 1965. In April 1968 our denomination merged with the Methodists which became the United Methodist Church. 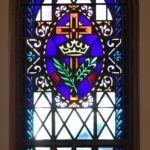 The windows in our church are all made of imported glass. This glass was imported from England, Germany, France, and Italy. 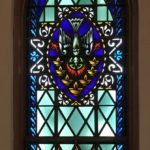 The artist of the windows was Mr. Erhard Stoettner of the Esser Glass Company of Milwaukee. Several of the symbols were created specifically for our church. 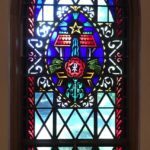 The Window Committee established by the Building Committee in 1952 consisted of Elmer H. Miller, Reverend Kenneth Krueger, Florence Zoerb, Leona Barteck, Irene Miller, and Leona Eichberg. The Rose Window in the front of the chancel contains one thousand pieces of glass. The dove in the center signifies the Holy Spirit. 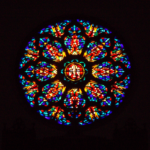 The eight sections of the rose window symbolize the eight Beatitudes, the rules of conduct for the born-again Christian. 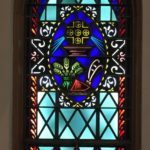 This window was donated by E. H. Miller. There are 16 windows in the pew area of the sanctuary. The first window is the hand of God. Donated by Anton & Emma Zoerb. 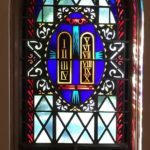 The second window depicts the Ten Commandments. There are two tablets of stone. The first four are commandments in relation to God; the second tablet of six is our relation to one another. Donated by John Braeger, Johnnes Scheiers, and the Reverend George Harm. Reverend Harm was the pastor of Fountain Park from 1871-73. 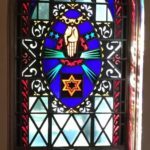 The third window shows the ark of the covenant. The children of Israel carried this ark with them in the wilderness signifying God’s protective hand. Donated by the John Schieble family. 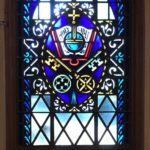 The fourth window is the prophetic voice of the prophets. The coal of fire is taken off the altar and Isaiah’s lips were touched (Isaiah 6). Donated by Christian and Anna Epp, pioneer settlers in Sheboygan. 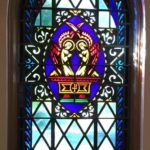 The fifth window is the connecting link between the Old and New Testaments. It is the picture of the Root of Jesse. Jesse was the son of David, the son of Jesse. He is the fulfillment of the Old Testament. Donated by William F. and Emelia Donath Miller. The sixth window shows the nativity scene. Donated by Alvin & Ann Haberland. The seventh window portray the ministry of Jesus. He is the “Light of the World.” Donated in memory of Mrs. Helen Francis Evans. 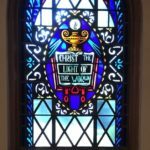 The eighth window shows the keys that Christ opens the way to knowledge and truth. Donated in memory of William and Henrietta Hermann by their son and wife, Elmer and Ella Hermann. One of the founding members of the church. 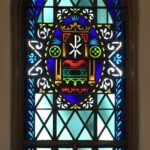 The ninth window portrays the cross and lilies, the symbol of eternal life and our heavenly home. Donated by Carl Poppe in memory of his wife Eva. 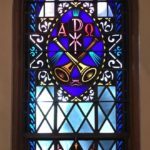 The tenth window illustrates the two trumpets that signify the return of Christ to this earth. This is our blessed hope. Donated by the Ernest & Emma Barteck Family. 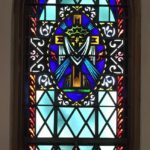 The eleventh window emphasizes stewardship. This is the parable of the five talents, with the plow and the sheaves. Tithing makes this church possible. Donated by Mr. George Zimmermann. 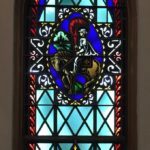 The twelfth window is in honor of the circuit rider representing our forefathers who came to the interior of America preaching the gospel. Our first minister, Joseph Harlacher, came on horseback to Wisconsin in 1848. Donated by Mr. and Mrs. Carl Glaeser. 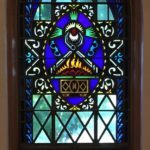 The thirteenth window is the dove, with seven flames representing the Holy Spirit and the seven of the nine gifts of the Spirit; love, joy, peace, patience, kindness, goodness, faithfulness, meekness, and self-control. Donated by Elmer & Althea Miller. Elmer served as chairman of the building committee when the present church was constructed. The fourteenth window pictures the empty tomb. This is the story of Easter. Donated by Mr. and Mrs. Edward Strains. Edward owned a paint store in Sheboygan. Edward painted the church during its construction as documented in the Building Committee minutes. 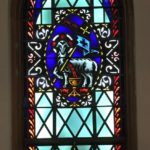 The fifteenth window shows the Lamb of God slain for the sins of the world. Donated by August and Mary Dettman. The sixteenth window portrays the Good Friday story. Jesus died for our sins on the cross. Notice the seamless robe draped across the cross. Donated by Leonard and Carol Lendved. They were pillars of the church.